When we’re born we have a mouth perfectly suited to accommodate the 32 teeth that will come in between now and our early 20’s. However, sometimes something goes awry, and we end up with more teeth than we bargained for. 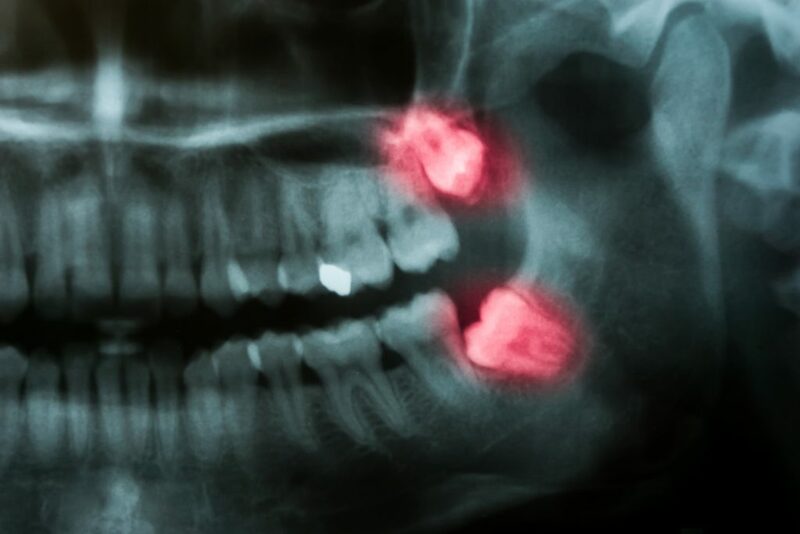 Of all dental patients over 50% end up receiving their wisdom teeth, and in a good portion of those there’s no room for these teeth to grow in. The result is impaction, teeth that are being compressed, shifted, or broken due to the additional pressure from teeth where there’s no room for teeth to be. How Will I Know I Have An Impaction? People who have spent their lives going to regular dental visits are the ones who have to worry least about wisdom teeth. While regular visits to the dentist don’t mean that they get any extra room in their mouth, it does mean that the dentist is typically aware of the presence of wisdom teeth and can remove them before they start to become a problem. Shifting teeth, pain and stiffness, odd infections and even tumors will tip them off so they can stop it before any actual damage is done. What Are The Results Of An Untreated Impaction? Impactions that go untreated can result in broken teeth, teeth that are moved out of alignment, or damage to one or more structures within the mouth. Teeth are often chipped, cracked, or otherwise permanently altered as a result of the incoming teeth compressing them. Because of these potential consequences its vital that an impaction gets treated before it causes severe damage. What Kinds Of Tooth Impaction Are There? Impactions are broken into six different classifications defining the placement and direction of the impaction. While wisdom teeth are the most commonly affected, they are not the only teeth that can have problems coming in. Mesial Impaction – Forward facing growth of the tooth. Distal Impaction – Rear facing growth of the tooth. Horizontal Impaction – Tooth growth parallel to the jaw. Vertical Impaction – Normal tooth growth but without sufficient room. Soft Tissue Impaction – A tooth that is partially erupting through the gum. Bony Impaction – Teeth that are encased in bone and trying to come in. Impactions from wisdom teeth are reality for over 50% of dental patients, while impactions resulting from other complications are rarer. If you think you might be experiencing some of the symptoms associated with impaction contact your physician for an appointment today. Acting quickly will help you avoid the worst complications that can result from impaction. If you’re living in the Covington LA area you can have your impaction treated by the skilled staff at Magnolia Dental. Led by Dr. Ross Quartano this clinic provides exceptional dental services for everyone in their community. Don’t let an impaction ruin your smile or make you live your days in pain and misery from resulting complications, pick up the phone and make an appointment in Covington today! Previous Post: What are Zirconia Crowns?